The thing Lester Ricard Jr. remembers most about the summer of 2005 is a rising certainty: It was going to be his season. The former Parade All-American quarterback had transferred to Tulane from LSU two years earlier, then won the starting job as a sophomore, and was now returning for his junior season to head up a team believed to be among the best in school history. They weren’t ranked — Green Wave football wasn’t a program that got a lot of attention in the polls, not since 1998’s 12-0 run — but everything was setting up for another climb into the limelight. That Saturday morning, August 27, was move-in day on campus, and the football team was traditionally tasked with hauling luggage for their fellow students. “Obviously, I was wanting to go where all the girls’ dorms were,” said Ricard. “They needed help, and that’s what I was here for. I’m a strong guy.” He remembers limiting the number of suitcases he was trying to pick up at one time, in fear of having to tell his coaches he’d messed up his back trying to impress a bunch of freshmen. 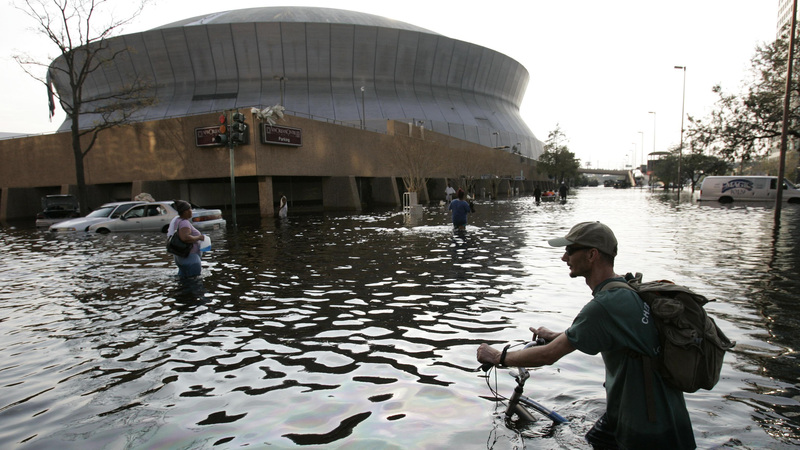 Eric Gay/AP A man pushes his bicycle through floodwaters near the Superdome in New Orleans on August 31, 2005. You can make the trip from Tulane to the football team’s evacuation point in Jackson, Mississippi, in about three hours. The bus ride for Tulane’s football players that Sunday took 10. Terranova estimates they sat in traffic on the streets of New Orleans for seven hours before their convoy managed to crawl its way out of the city. At Jackson State University, the team bedded down on mats and air mattresses in a gymnasium. Katrina hit New Orleans that Monday morning, August 29, as a Category 3 storm, and by nightfall had reached Jackson as a Category 2. The squad was just finishing an indoor workout when the lights went out in the gym. “And we’re trying to shower with flashlights,” said Ricard. “We got guys yelling, ‘C’mon, man, turn it over here so I can get my back.’” Terranova dropped his phone in a toilet trying to light his way through a bathroom. Instant communication was possible in 2005, but not quite mainstream.1 Several 2005 Tulane staffers recall learning for the first time during Katrina that their phones had texting capabilities. Phones were down throughout the New Orleans area; the university’s email server had flooded. The players, told they’d either be back on campus in a couple of days or would go straight to Hattiesburg from Jackson for their first game, had packed for just a couple of days away, and the team’s resources were dwindling fast. The next day, Tuesday, the decision was made to postpone the Green Wave’s first scheduled football game and to bring the team to Dallas, where it could be housed near — and receive organizational assistance from — the Conference USA offices. The full impact of the storm became clear before the team got to Texas, when the buses pulled off the road at an Interstate 20 rest area. “Coach lets all the guys off to let their legs out, grab something to eat if they want to,” said Ricard. “And when we go inside, it hits. There’s TVs all over the truck stop. And all of a sudden you see the damage. And we’d been getting the wildest stories, that there were alligators running around downtown New Orleans, anaconda snakes, that the chief of police had been murdered. We get on the bus, and you can hear a pin drop. No one’s talking. “I think everyone probably had some moments where it was like, look at what’s happening in our city, is it right to continue? Is this something we should be doing?” said former assistant athletic director Donna Turner. Initially inclined to call off the season for all the school’s fall sports teams, Dickson says he changed his mind after speaking with the athletes, including Ricard and his own daughter Kelly, a senior volleyball captain for the Green Wave. On Friday, Tulane canceled classes for the semester and announced its athletic teams would continue to compete as a functioning arm of the university. Offers of help for the team started with necessities and worked their way up from there. Jim Wilson, a real estate developer and former Tulane letterman,3 sent the team to a mall and paid for every player to be outfitted with T-shirts, underwear, dress shirts and shoes, and khakis. Dickson’s wife, Brenda, checked them all out at the Dillard’s counter, summer-camp-style. USC athletic director Mike Garrett called to say he’d put a $50,000 check in next-day mail. (“I said, ‘Great, Mike, because I’m opening a checking account tomorrow,’” said Dickson. “Everything at Tulane was frozen. We didn’t know how people were going to get paid, any of that.”) When Dickson called the Naval Academy to say he wasn’t sure the team would be able to play anything beyond its conference schedule, AD Chet Gladchuk4 informed him the Midshipmen would be picking up the tab for the Green Wave’s hotel rooms, were upping Tulane’s guarantee for the game, and would feed the team. Dickson’s former equipment manager at Washington State, then at Arizona, shipped blank uniforms to Dallas so the volleyball squad could participate in that weekend’s tournament. LM Otero/AP Tulane football players Christian Okoye, left, Taurean Brown, center, and Chris Bordelon, right, arrive at the Campbell Center DoubleTree after practice in Dallas on September 5, 2005. Senior night came and went in a 38-14 loss to Tulsa played in Louisiana-Monroe’s mostly empty stadium. Relationships between the staff and players frayed. “It might have been three weeks left,” said Terranova. “I was just done. I was ready for the season to be over.”6 The Green Wave lost the postponed Southern Miss game, 26-7, to finish with a 2-9 record. 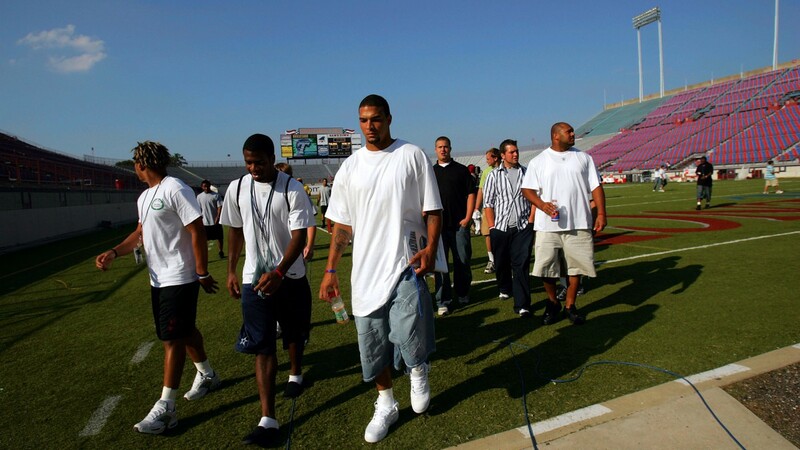 Ronald Martinez/Getty Images The Tulane football team arrives for a home game against Mississippi State on September 17, 2005, at Independence Stadium in Shreveport, Louisiana. To replace Scelfo, Dickson tapped a New Mexico offensive coordinator and former UCLA head coach, the delightfully witness-protection-named Bob Toledo. His West Coast offense proved an ideal match for Forte, who waged a 2,000-yard rushing campaign his senior season and would go on to be drafted in the second round by the Chicago Bears. Despite Forte’s feat, the Green Wave won just four games in 2007 and never bested that total in three subsequent years. Halfway through the 2011 season, Toledo resigned. For this coaching search, Dickson cast his eyes closer to home, and what more indelibly New Orleans selection could have been made than a member of Sean Payton’s first Saints staff? Curtis Johnson Jr., a native of St. Charles Parish and a career wide receivers coach, became the first African American in school history to head up the program on December 5, 2011. That same week, a campaign was announced to build a small on-campus stadium for the football program, removing the Green Wave from the cavernous confines of the Superdome. Today, both quests have borne fruit. Johnson’s first Tulane team went 2-10. His second squad, in 2013, jumped out to 7-5, making for the first winning Green Wave season and bowl appearance since 2002. Tulane lost the New Orleans Bowl, an entirely hometown affair, 24-21, to the Ragin’ Cajuns. Hindered by widespread youth (Johnson played at least 23 freshmen in 2014) and a stingier schedule in the team’s first season in the AAC, last season’s Green Wave averaged a dreadful 16 points per game, didn’t field a defense capable of backing that number up, and dropped back to 3-9. 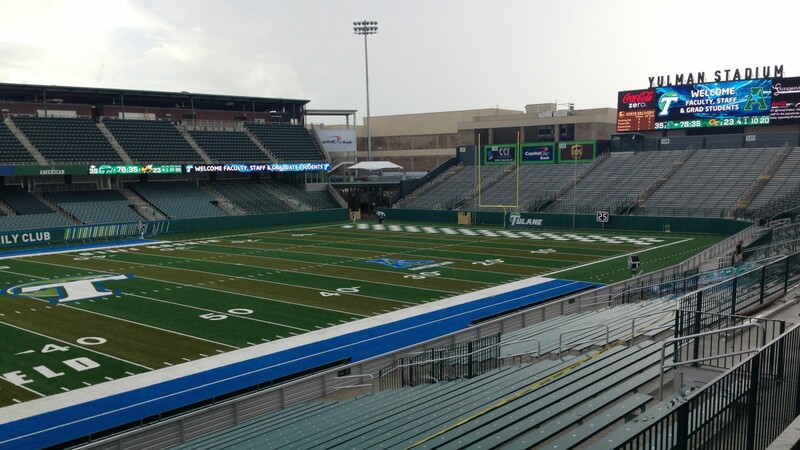 Brett Martel/AP Yulman Stadium in New Orleans opened last season for Tulane football games. Tulane football is more at home now, geographically and demographically, and it’s not just the venue that feels more specifically of New Orleans than before. There was no Steve Gleason punt block for the Green Wave, no analogue to the Saints’ Super Bowl victory for the city to rally around. The team isn’t instantly emblematic of the city in the way its pro team is, but that’s the thing with sea changes. You can’t ever tell just from looking at a few waves whether the tide is coming in or going out. You have to stand still, play close attention, sink your feet into the ground a little. For orientation’s sake, remember that the release of the first-generation iPhone was still almost two years away. Which would famously be at the center of the Hurricane Katrina story. The Wilson Athletics Center on Tulane’s campus also bears his name. He previously served as Tulane’s athletic director from 1987 to 1990. The Saints also spent the entire season away from New Orleans, splitting their home games between San Antonio and Baton Rouge. In a bizarre off-field incident right about this time, Tulane’s punter, Chris Beckman, was shot in the liver with an elephant gun in a hunting accident. Unrelated to football, in November 2005 Tulane linebacker Brandon Spincer was murdered in Jefferson Parish. After initially agreeing to be interviewed for this story, Scelfo did not respond to multiple phone calls and text messages seeking his perspective on the 2005-06 seasons. From the Department of Timing Is Everything: Dickson recalls the first formal meeting to discuss a new stadium was held in July 2005.